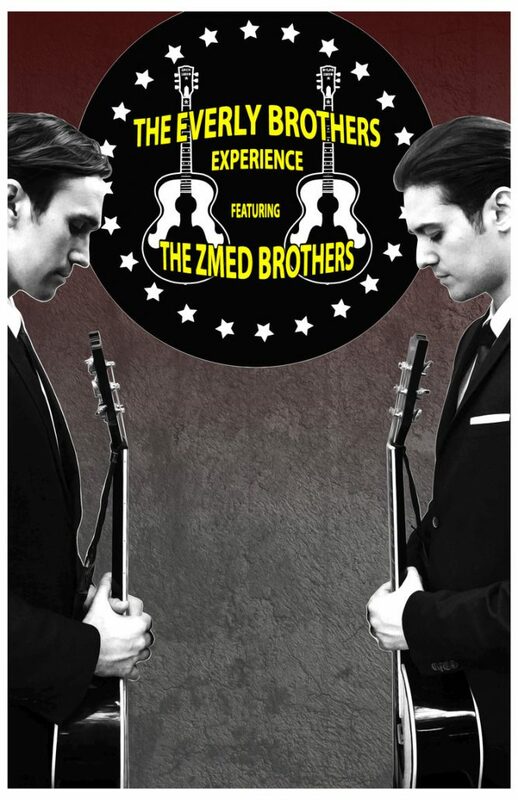 Our next show, “The Everly Brothers Experience” featuring the Zmed Brothers is fast approaching and tickets are selling fast! Join us next Saturday, August 25, 2018, at 7:30 pm and listen to the Zmed Brothers recreate all of the greatest hits of the Everly Brothers! In 1986, the Everly Brothers were among the first 10 artists inducted into the Rock and Roll Hall of Fame. They were introduced by Neil Young, who observed that every musical group he had ever belonged to had tried, and failed, to copy the Everly Brothers’ harmonies. That year, on July 5, the Everlys returned to Shenandoah to a crowd of 8,500 for a concert, parade, street dedication, class reunion, and other activities. Concert fees were donated to the Everly Family Scholarship Fund, which gives scholarships to middle school and high school students in Shenandoah. The brothers were inducted into the Iowa Rock ‘n’ Roll Hall of Fame in 2003. In 1997, the brothers were awarded the Grammy Lifetime Achievement Award. They were inducted into the Country Music Hall of Fame in 2001 and the Vocal Group Hall of Fame in 2004. Their contribution has been recognized by the Rockabilly Hall of Fame. On October 2, 1986, The Everly Brothers received a star on the Hollywood Walk of Fame for their work in the music industry, located at 7000 Hollywood Blvd. In 2004, Rolling Stone magazine ranked the Everly Brothers No. 33 on its list of the “100 greatest artists of all time”. They are also No. 43 on the list of UK Best selling singles artists of all time. Don’t wait, you’ll want to get great seats for this show! Call us today at 814-467-9070, Monday through Friday, from 10 am to 4 pm. Or click on the BUY TICKETS tab of this website, pick the Everly Brothers show, click on the date, review the seating chart and pick your seats, and then pay for them with a debit/credit card. Make sure you print out your confirmation sheet – this acts as your ticket for the night of the show. “I’m Waiting For You”…………. Time is Running Out……..